Scroll down to see the top not-for-profit colleges and universities in New York offering online degree programs. Excelsior College was founded in 1971 by the New York State Board of Regents to focus on adult learners, and more than half of students are in their 30s or 40s, with three-quarters of them working full time. The college has more than 30 online degree and certificate programs, from associate degrees through master's degrees in six general areas: business, technology, health sciences, nursing, public service, and liberal arts. The most popular programs are Associate of Science in Nursing and Bachelor of Science in Liberal Arts, which is the program that accepts the most transfer credits. Excelsior awards academic credit for professional certifications and military training, and a prior learning assessment is available to find other credits. SUNY Empire State College was designed to provide nontraditional teaching and learning to students who want an individualized degree program. The college offers undergraduate degrees in 12 broad areas, with students selecting a concentration or interdisciplinary plan. Several graduate programs are also completely or partially online, including an MBA and graduate degrees in education and policy studies. SUNY Empire State also has partnerships with organized labor, the military, and private organizations to help their members further their education or meet licensing requirements in a low-cost, convenient method. The online learning program uses a peer tutoring system that helps students whether they need assistance with course content or skills such as time management. Utica College's online options include 10 degree programs leading to a bachelor's or master's degree, and it also has an online doctorate in physical therapy. Bachelor's degrees are available in criminal justice: economic crime investigation; cybersecurity and information assurance; and in nursing for RNs. All three bachelor's programs are degree-completion programs that require students to have earned an associate degree or equivalent. Online master's are granted in business administration, cyber policy and risk analysis, cybersecurity, economic crime and fraud management, financial crime and compliance management, health care administration, and liberal studies. Some online programs require an internship or clinical practicum, which students can arrange in their home community. A few of the online programs require a short - three or four days - on-campus residency. Utica College accepts transfer credits from accredited institutions and determines how much credit will be given during the admissions process. The college provides 24/7 technical support to online students. Utica is a military friendly school and offers a 10 percent tuition discount for active duty, reserve and guard members and their spouses. Online students may be eligible for financial aid. Stony Brook University's School of Professional Development (SPD) offers seven fully online programs leading to master's degrees or advanced graduate certificates. Students can earn a master's in higher education administration, liberal studies, or human resource management. Advanced graduate certificates are offered in educational leadership, coaching, higher education administration, and human resource management. SPD's online classes are 10-week seminars that require students to log in and participate at least three days a week, although they have flexibility in when to log in. Stony Brook is also home to a fully online Master of Science in Nutrition degree program, and a fully online Bachelor of Science in Electrical Engineering. The engineering program is a degree completion program covering the final two years of a bachelor's degree. Students are provided course materials and labs online, but they may be required to go to an approved center for proctored tests. Stony Brook also offers a bachelor's degree completion program for Registered Nurses that is offered online but has some on-campus requirements. Mercy College offers 40 online degrees, which means nearly half the 90 degrees it offers overall can be completed over the web. Both undergraduate and graduate degrees are available online, along with some accelerated programs that result in a bachelor's and a master's degree. Business, nursing, behavioral science, and cybersecurity are just some of the programs that are offered online. Many of the programs are housed in the School of Education, which provides degrees and professional certificates for educators. Mercy's online programs have received national recognition, and U.S. News & World Report listed the online bachelor's, online graduate education, and online nursing programs among top programs in its 2014 survey. Monroe Community College is one of the top producers of associate degrees in the nation, and more than half of graduates continue on to a four-year college. It's no surprise, then, that many of the programs available online cater to students who want a transfer degree. Options that can be taken 100 percent online include transfer degrees in business, teacher education, math, and general studies. In addition to a dozen programs that are all online, Monroe has an equal number that are available at least 75 percent online. Monroe also participates in Open SUNY, which allows Monroe students to take online courses developed by any of the 64 campuses of the SUNY system. The Graduate School of Education (GSE) at the University of Buffalo offers online Master of Education (EdM) degrees in five discipline areas: education and technology, English education, math education, music education, and science and the public. The school administers the EdM in Science and the Public program jointly with the Center for Inquiry. The program is offered only online on a part-time basis. GSE also has three Master of Science (MS) degrees available online - MS in Rehabilitation Counseling, MS in School Librarianship, and MS in Information and Library Science. At the current time, there is only one online doctoral program, which is the Doctor of Philosophy (PhD) in Curriculum, Instruction, and the Science of Learning. This program consists of a total of 72 total credit hours, which includes 10 credit hours that can be transferred from a master's degree in a related field. Advanced Graduate Certificate (AGC) degrees are available in diverse fields including (but not limited to) rehabilitation counseling, educational technology, and school business and human resource administration. All AGV programs consist of 15 credit hours with the exception of the AGC in Information and Library Science (18 credit hours) and the AGC in Mental Health Counseling (12 credit hours). Online students at SUNY Delhi have access to technical help, online tutoring, library services, academic advising, and other services that students who attend class on campus receive. Online students have the option of three degree-completion programs, a master's degree in nursing, and an associate degree specifically for union electricians. The online master's degree is a Master of Science in Nursing Education, a 42-credit program that allows nurses to complete practicum experiences in their home community. Working nurses can enroll as full-time or part-time students. Coursework is delivered in seven-week sessions with two sessions scheduled each semester. Registered nurses with a diploma or associate degree can complete a Bachelor of Science in Nursing online. The other two online degree-completion programs lead to a Bachelor of Science in Criminal Justice or a Bachelor of Business Administration in Hospitality Management. The programs are designed for students who already have an associate degree, and students may be eligible for academic credit for experience. The Associate in Occupational Studies in Electrical Construction and Instrumentation is open to IBEW electricians, who receive academic credit for completing the journeyman wireman apprenticeship program. Syracuse University currently offers two online graduate-level degree programs through the iSchool: Master of Science (MS) in Information Management and MS in Library and Information Science. The MS in Information Management is comprised of 42 credits and can be pursued on a full-time or part-time basis. Students accepted to the program can customize their learning experience and design a plan of study that supports their professional and personal goals. The program can be completed in as little as 21 months. There is 30-credit MS in Information Management for Executives program that can also be completed online. Applicants must have a minimum of six years of full-time professional experience in a related field. The program can be completed in as little as 15 months. The MS in Library and Information Science degree is accredited by the American Library Association (ALA) and designed for librarians working in a variety of settings, such as academic institutions, government agencies, and public libraries. The program is comprised of 36 credits and can typically be completed in 18 months. Students enrolled in these two programs have the option of completing an online Certificate of Advanced Study (CAS) in either Data Science or in Information Security Management. SUNY Erie Community College has online programs both for students who plan to transfer to a four-year school and for students who want to gain new skills for their job. Transfer options include Associate of Art and Associate of Science degrees in topics such as social sciences, humanities, or business administration. Associate of Applied Science degrees for students seeking job skills include Information technology and criminal justice/law enforcement. Some shorter-term certificates are also offered online, including accounting technician, homeland security, and entrepreneurship. One unusual step ECC takes is to flag some online courses as Low-Cost Classes. These courses have the same tuition costs, but the cost for textbooks, access codes, and other materials is $30 or less. Most of the online degree programs offered through SUNY Canton Online have an experiential component, with students working an internship for a semester or more. SUNY Canton Online offers bachelor's degrees in emergency management, finance, health care management, homeland security, legal studies, management, and criminal justice: law enforcement leadership. Many of the majors offer the entire four-year program online, and they are appropriate for students with a professional or education background in the field as well as for new students. SUNY Canton Online has two degree-completion programs designed for associate-degree-holders who are already working - a Bachelor of Science in Nursing completion program and a Bachelor of Business Administration in Veterinary Service Administration, which provides a seamless transition for students who have a two-year degree in veterinary science technology. Online courses are delivered in an asynchronous format so students can log in and study where and when they want. Online classes are offered throughout the year. There are currently three online degree completion programs available from the School of Professional Studies (SPS) at NYU. These are: Bachelor of Arts (BA) in Social Science, Bachelor of Science (BS) in Digital Communication and Media, and BS in Leadership and Management Studies. The BA in Social Science offers only one concentration area online, which is in the field of organizational behavior and change. The BS in Leadership and Management Studies however, offers three online concentrations: international business, human resource management, and organizational management and development. SPS also offers online Master of Science (MS) degrees in the following disciplines: professional writing, real estate, human resource management and development, translation, management and systems, and in graphic communications technology and management. NYU's School of Engineering offers the following degrees online: MS in Bioinformatics, MS in Computer Engineering, MS in Cybersecurity, MS in Electrical Engineering, MS in Industrial Engineering, and MS in Management of Technology. The School of Law offers two online graduate degrees - Master of Studies in Law (MSL) in Taxation and an Executive Master of Laws (LLM). Three MS programs (in business analytics, global finance, and risk management) are currently offered online by the Stern School of Business at NYU. Marist College offers an online liberal studies program designed specifically for adult learners. Students can choose to pursue a Bachelor of Arts or Bachelor of Science degree in one of several disciplines such as information technology and systems, project management, or organizational leadership and communication. Marist College has endowed scholarship opportunities designated for adult learners, including the Anthony J. Kondysar '69 Memorial Scholarship for Adult Students, the James A. Kyle '09 Memorial Scholarship (for IT students), and the Marguerite Feinstein '74 Memorial Scholarship (for working mothers). Scholarship recipients must commit to completing their chosen degree program within three to five years. On the graduate level, Marist College offers Master of Arts (MA) degrees in three areas: integrated marketing communication, educational psychology, and communication. The communication programs have no residency requirement and can be completed entirely online. The MA in Educational Psychology program follows a hybrid system of delivery and offers tracks in childhood education and in adolescence education content areas. Applicants must hold initial certification in their field of interest. The following degrees complete the current online graduate degree offerings at Marist College: Master of Business Administration (MBA), Master of Public Administration (MPA), and Master of Science in Information Systems (MSIS). Students can earn a variety of associate degrees totally online from Cayuga Community College. Three online degrees are designed for students who plan to transfer to a four-year school: business administration and liberal arts programs in the humanities or in science and math. Associate of Applied Science degrees are online for students planning to go straight into a career in criminal justice, event and tourism management, or business. Certificate programs covering those topics are also online. About half the classes for the Associated of Applied Science in Computer Information Systems can be taken through online classwork. Most online classes do not require students to ever go to campus, although some instructors may require proctored tests. SUNY Polytechnic Institute has online programs and graduate certificates in fields such as business, technology, and nursing. The online MBA program results in an MBA in Technology Management. Full-time students can complete the degree in two years. MBA applicants must submit GMAT scores, and students may enter the program in the fall or spring. The online Master of Science in Accountancy is a 33-credit program that satisfies the 150-hour requirement to sit the CPA test. The program is designed for students who have an accounting degree, but other students can enter the program after finishing prerequisite classes. The Master of Science in Information Design and Technology is a 33-credit program that requires applicants to have a GPA of 3.0. Nurses can earn a graduate certificate or Master of Science in Nursing Education. Full-time students can earn the 36-credit degree in four semesters. The program also accepts part-time students. SUNY Polytechnic also has an online Advanced Certificate in Data Analysis, which requires applicants to meet prerequisites including three semesters of calculus and a class in linear algebra. Genesee Community College, which is part of the SUNY system, has about 15 degrees and certificates that can be completed 100 percent online. About as many programs are available 75 percent online, and another two dozen are available at least 50 percent online. Online options include career and transfer associate degrees and career certificates. During Winterterm, the weeks between the fall and spring semester, a wide variety of classes are available online, allowing students to earn three credits during the winter holidays. The top five transfer schools for Genesee students include SUNY Brockport, Geneseo, and Buffalo State, Empire State College, and University at Buffalo. Finger Lakes Community College has seven online associate degrees, including two for students interested in the tourism industry. The Associate in Applied Science in Tourism Management was honored by the New York State Travel and Vacation Association as an outstanding career preparation program. Students who want a four-year tourism degree can start with an Associate in Science in Tourism Studies before transferring to another school. Other career degrees online are in business and accounting. Transfer degrees include liberal arts, business, and sports studies. FLCC has another two dozen programs, both career and transfer degrees, where at least 50 percent of coursework is available online. Canisius College offers 11 online degree programs, mostly in the fields of education, sports, and health. It also offers several advanced certificates for educators who already have a master's degree. Most of the degrees are offered in a 100-percent online format, but a few do have limited residency requirements. Education master's degrees offered online include educational leadership, education technologies and emerging media, literacy education, physical education, and teaching English to speakers of other languages. The literacy program requires a two-week summer residency in Buffalo, New York, to meet practicum requirements. Most of the programs result in specific New York State teacher certifications, and teachers who already have a master's can earn some of those certifications through the advanced certificate programs Canisius offers online. Other online programs lead to master's degrees in sport administration, applied nutrition, community and school health, health information technology, respiratory care, and anthrozoology. The anthrozoology program, which examines mankind's relationship with other species, is presented in a hybrid format that requires students to meet on campus at the beginning of each semester for four days of class sessions. The Rochester Institute of Technology has more than 30 programs available in an online environment, and online students can earn anything from a 12-credt certificate to a bachelor's or master's degree. RIT Online delivers courses in an asynchronous format, with some classes following a traditional 16-week schedule and others following an accelerated eight-week schedule. Students can enter the programs at five points during the year. Online students can use a "concierge service" RIT provides to get support and academic advice or to be directed to a school resource. The RIT Online Campus is a virtual campus where students can stay connected to classmates in the online community. Master's degrees offered online include MBA, applied statistics, human resources development, health systems administration, and environmental, health and safety management. Advanced certificates are offered in communication and digital media, health care finance, information assurance, project management, and networking, planning and design. Bachelor's degrees are available in applied arts and science and applied technical leadership. An associate degree and diploma are also available in applied arts and science. St. John's College offers associate, bachelor's and master's programs online that never require students to come to campus. Courses are delivered in an asynchronous format, so students do not have to log on at a set time, and classmates participate in online discussion boards. Occasionally, a professor may ask students to be online at a specific time for a discussion or conference, but that is not typical. Students who attend St. John's online have access to the same services as on-campus students, such as library databases, academic advisement, career services, and writing assistance. Online students are eligible to apply for any scholarships St. John's awards that they meet the criteria for. The College of Professional Studies offers online bachelor's and associate degrees in business administration/administrative studies, criminal justice, and liberal studies/liberal arts. Online master's programs include Master of Science (M.S.) in Accounting, Master of Arts in Global Development and Social Justice, M.S. in Taxation, M.S. in Library and Information Science, Master of Science in Education (M.S.Ed.) in School Building Leadership, M.S.Ed. in Teaching Children with Disabilities in Childhood Education, M.S.Ed. in TESOL, and Master of Arts in Theology. Several advanced certificates for educators are also offered online. Pace University's iPace program provides busy working adults a way to earn an online degree no matter how many credits they have available to transfer. Applicants with an associate degree or at least 56 transferrable credits can enter a bachelor's degree program that allows them to earn a career-oriented degree with 100 percent online classes. All coursework is asynchronous, so students can view coursework when it fits their schedule. Students with an associate degree can enter the Bachelor of Business Studies program, which offers concentrations in marketing and management or in accounting and internal auditing. The Bachelor of Science in Professional Communications Studies prepares students for jobs with a marketing, public relations, or social media focus. The Bachelor of Science in Professional Technology Studies allows students to concentrate in computer forensics or business technology leadership. The last degree completion program iPace offers leads to a Bachelor of Science in Nursing and is open to registered nurses who hold a diploma or associate degree. Students with fewer than 56 college credits can enter the iPace Associate in Arts and Sciences program to earn an associate degree that will allow them to enter any of the degree completion programs. There are currently three undergraduate programs available online from the State University of New York (SUNY) in Oswego: Bachelor of Arts (BA) in Broadcasting and Mass Communication, BA in Public Justice, and Bachelor of Science (BS) in Vocational Teacher Preparation. Students who wish to be considered for the BA in Broadcasting and Mass Communication program must have an associate degree in a related field from an accredited institution. Students can expect to earn the degree after two years of continuous full-time enrollment, although a part-time plan of study is possible. SUNY's online Master of Business Administration (MBA) degree follows the same curriculum as the on-campus MBA program. Only up to six credit hours of approved graduate-level work may be transferred from another accredited program. SUNY's MBA degree is comprised of 36 graduate credit hours. In addition, the university offers a Healthcare MBA degree, which consists of 45 graduate credit hours and can be pursued online as well. A Master of Science in Education (MSE) in Vocational Teacher Preparation is also available online. SUNY Oswego offers post-baccalaureate advanced certificates online in the following areas: behavioral forensics, health information technology, integrated health systems, nursing home administration, interdisciplinary trauma studies, and health and wellness. The College of Engineering and Applied Science at SUNY Albany offers a fully online Bachelor of Science in Informatics degree. Students are required to complete at least 33 credits in the major, which includes nine credits of experiential learning. SUNY Albany's School of Education currently offers Master of Science (MS) degrees that can be pursued entirely online. These degrees are: MS in Childhood Education, MS in Curriculum Development and Instructional Technology, MS in Early Childhood, and MS in Reading. Students who wish to be considered for the MS in Childhood Education or the MS in Early Childhood programs must already have their initial teacher certification in these areas. The school also offers online certificate programs in the following fields: online learning and teaching, adolescent special education for childhood special educators, and special education for content teachers. The university offers an online Master of Public Health (MPH) degree with a concentration in public health practice. Applicants must have a minimum of three years of work experience in the public health field or a related discipline. At the current time, there are three online certificates available: global health, public health surveillance and preparedness, and public health fundamentals and principles. The Parsons School of Design at The New School offers the following programs online: Associate of Applied Science in Fashion Marketing (only available online, includes a summer study abroad component) and a Master of Science (MS) in Design and Management. The School of Media Studies has two online programs available, both on the graduate level: MS in Media Management and Master of Arts (MA) in Media Studies. The School of Languages offers an online MA in Teaching English to Speakers of Other Languages (MA TESOL) program that can be completed in just one year, if a student follows a full-time plan of study and enrolls in the summer intensive. Non-traditional students are encouraged to explore The New School's Bachelor's Program for Adults and Transfer Students program. Qualified applicants can transfer up to 84 credits and receive credit for prior learning (up to 30 transfer credits) by preparing a portfolio or taking an exam. Students can design their own program in liberal arts or choose from the following areas: environmental studies, food studies, global studies, media studies, psychology, urban studies, and musical theater. Online certificate programs are also available in graphic and digital design, fashion business, and in screenwriting. The School of Interdisciplinary Studies and Education at the New York Institute of Technology offers three online degrees in interdisciplinary studies: Bachelor of Arts, Bachelor of Science, and Bachelor of Professional Studies. Students are given the freedom to customize their learning experience by building on a core curriculum and choosing up to three areas of concentration from diverse fields such as behavioral sciences, communication arts, labor relations, and technical writing. The school offers two additional programs online - Master of Science (MS) in Instructional Technology and MS in Childhood Education. The MS in Instructional Technology program has specialized coursework designed for trainers and educators. An online MS in Clinical Nutrition degree is offered by the School of Health Professions. The program is comprised of 36 credits and accepts up to six graduate-level transfer credits from an accredited college or university. The School of Engineering and Computing Sciences offers a Master of Science (MS) in Energy Management degree that can be pursued online. The program consists of 30 credits and follows a curriculum that offers coursework in various areas including alternative energy, systems engineering and management, and smart grid systems. Advanced certificates are also available in energy technology, environmental management, and facilities management. The Graduate School of Social Service at Fordham University offers an online Master of Social Work (MSW) degree that can be earned on a full-time or part-time basis. Courses are offered asynchronously, giving students 24/7 access. The school also offers a hybrid MSW option in cooperation with Molloy College. Students accepted to this program can combine face-to-face classes at the college's Long Island campus with online coursework through Fordham University. Students can concentrate in one of two areas - clinical practice or leadership and macro practice. The Graduate School of Religion and Religious Education offers the following Master of Arts (MA) degrees online: MA in Christian Spirituality (42 credits), MA in Pastoral Care (36 credits), MA in Pastoral Studies (42 credits), and MA in Religious Education: Youth and Young Adults Ministry (36 credits). The MA in Christian Spirituality programs offers generalist, research, and spiritual direction concentrations. Online advanced certificates are offered in Christian spirituality, faith formation, and in Latino ministry. There is also an online Doctor of Ministry degree available. The School of Law offers Continuing Law Education (CLE) credits online. Past offerings have been approved by the New York State CLE Board for as many as three transitional professional practice credits. SUNY Plattsburgh offers an RN - BSN program that can be completed entirely online. Applicants who are licensed RNs or who have completed an associate or diploma program in nursing from an accredited institution can transfer up to 34 credits towards the BSN degree. A minimum of 36 credits must be taken at SUNY Plattsburgh. The program follows a cohort model of education and can be pursued following a part-time or full-time plan of study. Most students earn the degree after a little more than two years of continuous enrollment. The clinical or practicum requirements for the degree can be completed within a student's geographical area. The university offers a Master of Science (MS) in Fitness and Wellness Leadership degree that can also be completed 100 percent online. The program is comprised of 30 - 33 credits (13 courses) and an internship component that can be completed in the student's home community. Students who graduate from the program meet the academic requirements for certification testing from national organizations such as American College of Sports Medicine. An MS in Expeditionary Studies program is offered partially online from the university (6 of the required 11 courses are available over the Internet). Russell Sage Online, the online arm of The Sage Colleges, offers online degree-completion programs, online master's degrees, and certificate programs at the graduate and undergraduate level. All courses are delivered in an accelerated schedule that helps students to graduate quickly. Students may enter the programs in the fall, spring, or summer. The bachelor's programs are open to students who have at least 40 college credits or an associate degree. Options are a Bachelor of Business Administration, Bachelor of Science in Accounting, or Bachelor of Science in Information Technology - Cybersecurity. Online master's programs include an MBA with concentrations in human resource management, marketing, or project management; Master of Science in Applied Behavior Analysis and Autism; Master of Science in Health Services Administration (non-research option only); and Master of Science in Organization Management. Undergraduate certificates are offered in cybersecurity and information technology. Graduate certificates are available in applied behavior analysis, assessment and planning, teaching excellence, literacy certificate in teaching excellence, and technology integration in teaching excellence. The educational leadership program at Niagara University offers a Master of Science (MS) degree in the field, as well as certification/licensure programs for school, district, or business leadership. The MS in Educational Leadership program is comprised of 36 credits and can be completed after two years of continuous enrollment. Students who wish to be considered for one of the Certificate of Advanced Studies (CAS) programs must hold a master's degree from an accredited institution and complete 24 graduate hours of study. Niagara University's educational leadership program is accredited by the National Council for Accreditation of Teacher Education (NCATE). There is also an MS in Education - Special Education degree that is available online. Applicants must have a teaching certificate in their desired area of study (Grades 1-6 or in Grades 7-12). Qualified students can also pursue a CAS in Special Education degree online. The university currently offers one Master of Arts (MA) program online, which is the MA in Developmental Disabilities degree. Students can choose to focus in either the clinical or leadership concentration. The MA program is comprised of 39 credit hours and includes a culminating practicum experience. MA students receive tuition assistance for their first two courses in the program. The Master of Science in Taxation degree offered at Long Island University Post campus is comprised of 30 credits and can be completed entirely online. Advanced certificates in archives and records management (18 credits) and in mobile GIS applications development (12 credits) are also available 100 percent online. The following Master of Science (MS) degrees follow a blended system of delivery: MS in Accountancy, MS in Adolescence Education (pedagogy only), MS in Educational Technology, MS in Environmental Sustainability, MS in Library and Information Science, and MS in Nursing Education. A Master of Arts degree in TESOL (Teaching English to Speakers of Other Languages) and an Advanced Certificate in Nursing Education are also available in a blended format. Students pursuing the Bachelor of Science in Health Information Management degree offered by the School of Health Professions and Nursing can complete the final 30 credits of the program online. This portion of the program follows a cohort model of education and must be completed in one year. Graduates are qualified to sit for the national certification exam given by the American Health Information Management Association (AHIMA). Passing this exam is a requirement to become a Registered Health Information Administrator (RHIA). St. Joseph's College in New York offers several online undergraduate, graduate, and certificate degree programs in the following disciplines: business, criminal justice, general studies, health administration, human resources, human services, psychology and business, and religious studies. Students pursuing an undergraduate degree can transfer up to 90 credits from an accredited four-year college or university. Graduate students can transfer up to six credits. The online courses at the college are delivered asynchronously, giving students 24/7 access to study materials and class lectures. Students can pursue Bachelor of Science (BS) degrees in organizational management, criminal justice, general studies, health administration, and human services. The online Master of Science (MS) in Management program has three areas concentration: human resources management, organizational management, and healthcare management. Two Master of Business Administration (MBA) degrees are offered online - Executive MBA and MBA in Healthcare Management. The following dual degree programs are currently available: Executive MBA/MS in Management (organizational management concentration), BS in Organizational Management/Executive MBA, BS in Human Services/MS in Human Services Leadership, and BS in Health Administration/MBA in Healthcare Management. Certificate programs are offered online in the following areas: religious studies, industrial organizational psychology, leadership and supervision, and human resources. The State University of New York (SUNY) in Brockport offers a number of online programs in the fields of education, counseling, kinesiology, and liberal arts. Courses for these degrees are delivered both in synchronous and asynchronous formats. The Department of Education and Human Development offers a Master of Science in Education (MS Ed) program that can be completed online. Applicants must hold a New York State teaching certificate for grades 7-12 in order to be considered for the program. MS Ed degrees are currently available in biology, chemistry, earth science, English, math, physics, social studies, and bilingual education (Spanish). SUNY Brockport offers two additional MS Ed degrees - MS Ed in Physical Education Pedagogy (from the Department of Kinesiology, Sport Studies & Physical Education) and MS in Alternate Health Education (from the Department of Public Health & Health Education). At the current time, SUNY Brockport has online advanced certificate programs in two areas - bilingual education (Spanish) and in school counseling. The online Master of Arts in Liberal Studies program gives students the option of customizing their learning experience by allowing them to enroll in select courses that support their individual career goals. The program is comprised of 30 credits. The Ruth S. Ammon School of Education at Adelphi University offers a fully online Master of Arts (MA) in Educational Technology degree that is comprised of 32 graduate credits. Students have the option of completing the MA program in an accelerated format, which allows them to earn the degree in just 14 months. A Master in Health Informatics degree is also offered online. This is an interdisciplinary program that draws from the fields of business, information systems, data security and analysis, as well as organizational and project management. Applicants are not required to take the GMAT or to have previous work experience in the healthcare informatics field. The College of Nursing and Public Health at Adelphi University offers an online Master of Science (MS) degree in nutrition that consists of 34 credits (12 courses). Applicants to the program must be licensed professionals in their respective healthcare-related fields. There is an MS in Sport Management degree available online. Students accepted to the program can specialize in one of two areas - sports marketing or collegiate athletic administration. Adelphi University offers online Associate of Science, Bachelor of Science, and Master of Science degrees in the field of emergency services administration. Students who wish to begin a career in the healthcare field can explore the Bachelor of Science in Health Care Business program offered 100 percent online at Clarkson College. Although choosing an area of concentration is not required, students have the option of doing so in such areas as health care informatics, long-term care, medical coding, and public health. A Master of Science (MS) in Health Care Administration and a Post-Master's Certificate in Health Care Administration are also available online. Both are accelerated programs with courses starting every six weeks. Students who enroll in the post-master's certificate program can choose to pursue the operational track or the leadership track. The following online degree programs are available in the field of nursing: RN to BSN, RN to MSN, a stand-alone MSN degree, Doctor of Nursing Practice (DNP) and a Post-Master's Certificate in Nursing. Students who pursue the post-master's certificate can choose to specialize in one of four areas: family nurse practitioner, adult-gerontology primary care nurse practitioner, nursing education, and nursing health care administration. Additional online degree and certificate programs are available in the following: administration and management, educational leadership, health information management, imaging informatics, medical imaging, physical therapy, and radiologic technology. The Fu Foundation School of Engineering and Applied Science at Columbia University offers fully online graduate engineering degrees and certificates through the Columbia Video Network (CVN). At the current time, there are 22 Master of Science (MS) degrees offered online in the fields of applied mathematics (1), computer science (9), engineering (9), operations research (2), and applied physics (1). Courses for these programs are delivered asynchronously. Online certificate programs in computer science are available in the following areas: information systems, intelligent systems, multimedia networking, networking and systems, and new media engineering. Certificates are also offered in the fields of data science (1), engineering (12), operations research (1), business and technology (1), and applied mathematics (1). Students interested in pursuing an online doctoral degree can explore the post-master's programs available in computer science, electrical engineering, mechanical engineering, and earth and environmental engineering. Only students who received their MS degree in computer science from Columbia will be considered for the doctoral program in computer science. The School of Social Work offers an online Master of Social Work (MSW) degree with two areas of concentration - advanced clinical social work practice and social enterprise administration. Courses for the online MSW program are offered synchronously. The online Master of Science (MS) in Nutrition and Dietetics degree offered at the State University of New York (SUNY) Oneonta is a full-time program that can be completed in just three semesters. Students who earn the degree will be eligible to take the national examination for Registered Dietician. The program consists of 36 credits and includes 1,220 hours of supervised practice hours that can be completed in the student's home community. Online MS in Education degrees are available in the following disciplines: technology specialist (K-12), literacy education (B-6), and literacy education (5-12). Students who complete the 39-credit educational technology program meet the academic requirements for teacher certification and can apply for initial certification as Educational Technology Specialist. At least 24 semester hours must be taken at SUNY Oneonta to receive the degree from the university. Each of the literacy education programs (B-6 and 5-12) consists of 30 semester hours and graduates of either program fulfill the educational requirements for teaching certification in New York. SUNY Oneonta currently offers an Advanced Graduate Certificate in Bilingual Education Extension Pre K-12 (15 semester hours) and a Certificate of Advanced Study (CAS) in School Counseling (22 semester hours). Both programs are available online. Roberts Wesleyan College offers a range of degrees and certificates online in the fields of business, health administration, nursing, and teacher education. Coursework is delivered in an asynchronous format so students can view it when and where it suits their schedule. Most of the programs have multiple entry dates each year. Adult students who want to finish their bachelor's degree through RWC may be able to earn credit for military service, training received on the job, and other life experiences. Students must have 60 college credits before beginning the degree-completion programs, which result in a Bachelor of Science in Organizational Management, Bachelor of Science in Health Administration, or Bachelor of Science in Nursing. Undergrads may be able to complete their degree in as few as 15 months. Master's programs are offered in strategic leadership, health administration, health care informatics, nursing education, nursing leadership and administration, and special education. RWC also offers an online program that allows working nurses who have an associate degree or a bachelor's in a subject other than nursing to earn both their Bachelor of Science in Nursing and a Master of Science in Nursing in 29 months. The School of Education at Hofstra University offers two Master of Science in Education (M.S.Ed.) degrees that can be pursued entirely online - M.S.Ed. in Higher Education Leadership and Policy Studies and M.S.Ed. in Special Education: International Perspective. The school also offers fully-online advanced certificates in gifted education, educational technology, and work-based learning. The following certificate programs follow a hybrid system of delivery: applied behavior analysis, childhood special education (Grades 1-6),early childhood special education (Birth -Grade 2), special education (Grades 7-120), special education assessment and diagnosis, and teaching students with severe or multiple disabilities. The following programs are also available 100 percent online: Master of Business Administration (MBA) Master of Science (MS) in Computer Science, Master of Arts (MA) in Health Law and Policy, and Master of Laws in Health Law and Policy. Students accepted to the MBA program can choose to concentrate in one of two areas - strategic business management or strategic healthcare management. The program follows a cohort-based model of education and can be completed within two years. The following degree programs have significant online components, but follow a hybrid delivery system: MA in Public Relations, MA in Technology for Learning, MBA (Manhattan campus), and MS in Occupational Therapy. New York is a big state, and thanks largely to efforts by its public university system, a great one in which to earn an online degree. But we don’t want you to get overwhelmed by the choices, so we’ve developed this guide to selecting an online school in the Empire State. We’ll start by exploring the distance learning scene, then discuss individual schools that stand out for affordability — and those that stick out for accreditation troubles. Last, we’ll wrap everything up with a short list of resources to take you the rest of the way. Open SUNY is a tool for finding online degrees and courses within the State University of New York (SUNY) system. The system is composed of 30 community colleges that offer certificates and associate degrees, seven technology colleges that provide vocational degrees up to the master’s level, 13 university colleges for bachelor’s and master’s degree-seekers, and 14 university centers offering research-centered programs. (Learn more about the system at the SUNY website.) Open SUNY represents the combined online offerings of all 64 schools. That’s over 500 programs and 10,000 courses! To search for degrees, enter either the degree title or the most unique part of the school’s name (typing “SUNY” or “university” will add too many results). Or leave it blank and find matches by degree level and/or field of study. The site allows you to register so you can bookmark programs you’re interested in. Click on schools that meet your criteria to get program details or even apply for them, bypassing individual school websites. When looking for standalone courses, you can enter search criteria such as term, start date, campus and subject. You can also click the Campus GenEd button if you’re looking for transferable credits. SUNY not enough for you? The New York State Education Department maintains two directories of all the online degree programs in the state, one listed by institution and one listed by subject. How often the directories are updated is anyone’s guess, so don’t take them as gospel — they’re not a perfect match with what’s on school websites or Open SUNY. However, they are a useful starting point for finding distance degrees from private colleges or schools carrying the City University of New York (CUNY) label. (The directories also mention SUNY programs, but Open SUNY is a much better platform to research those.) Click on the link of any program to go to its website. If you look at Open SUNY, you’ll see that roughly half the online programs are associate degrees. And with SUNY’s 30 community colleges charging about 40% to 50% less per year than SUNY’s four-year institutions, it could make sense to look there for your first two years of baccalaureate studies. You can use SUNY Transfer Paths to map your route to a bachelor’s degree. Just choose your intended major and learn which associate-level courses meet degree requirements. Fall and spring are the traditional college semesters. But most SUNY institutions have taken advantage of that dead space in the winter and summer to offer online courses. Winter courses are necessarily accelerated, taking three to four weeks instead of the traditional 12. There’s more flexibility for summer courses, with students usually able to stack compact sessions back to back or stick with a normal term length. Why would you study during your break? Because by spending a couple of summers and winters hitting the books, you could graduate a year early and start your career. You can search for online courses at Open SUNY by filtering by term, but we recommend also checking out the college’s website. Most schools have a page dedicated to summer and/or winter sessions. Full-time undergraduates can take up to six credits at another participating SUNY campus. Cross-registration is not a seamless process, as it requires approval and the meeting of specific standards from your home school and the host institution, but it is a practical way to take fall and spring semester courses. Not every SUNY institution participates and the resources available at the SUNY website don’t clear up much. The best approach to finding out more is by downloading the most recent contact list or searching for cross-registration procedures at your school. There are two smaller consortiums you should be aware of. The first is the Western New York Consortium of Higher Education, which has 21 members, both public and private. Students are limited to cross-registering for one course per semester away from their home campus. The second is the Hudson/Mohawk Association of Colleges & Universities. (It lacks a website, but here’s University at Albany’s explainer with a list of participating institutions.) To take advantage, you have to be a full-time student taking at least half your classes via your home school. Although you can find highly regarded online programs in the state in just about any field, New York excels in three areas: IT, engineering and education. Schools such as New York University, Syracuse University and Pace University all pop up near the top of U.S. News & World Report’s rankings for Best Online Graduate Computer IT Programs. Meanwhile, a trio of private NYC schools (Columbia, Cornell & NYU) typically make an annual showing in the Top 20 Best Online Graduate Engineering Programs rankings. Last, New York is a populous state with many primary and secondary students; it needs teachers and administrators. And according to the Best Online Graduate Education Programs rankings, it’s producing good ones. Be sure to check out programs at the University of Albany-SUNY and the University of Buffalo-SUNY. Brace yourself because we’ve got a lot of ground to cover. 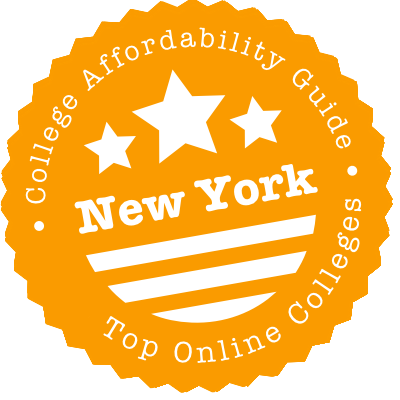 The following represent the best and most affordable schools from the State University of New York system, the City University of New York system, and New York’s many private institutions. They’ve met our criteria for quality, flexibility, price, and use of financial aid money. (See the CAG Score next to their profiles in our ranking.) Select a few of your favorites and use College Scorecard to compare their graduation rates and debt loads. Canisius, one of a handful of private colleges on our list, offers online graduate degrees and certificates. The starting tuition and fees at private colleges like Canisius run higher than at public institutions, but the overwhelming majority of Canisius students receive free money in the form of scholarships and grants, in addition to loans. Financial aid is equally available to online students. One benefit at Canisius is online summer sessions. By taking advantage of back-to-back accelerated five-week terms during the off-season, you can graduate quicker and still have a bit of downtime. Although it’s not part of SUNY, Canisius is a member of the WNY Consortium of Higher Education, which allows students to cross-register for one course per semester at the campus of one of the other 20 consortium members. Niagara University bestows online graduate degrees. (Simply scan for programs with “online” in the title.) If you’re just a run-of-the-mill student enrolling in such a program, take a moment to calculate tuition and fees and explore financial aid. Niagara stands out in three ways. First, Niagara partners with Ed2Go to offer accelerated courses and full certificates. They’re not for credit, but the training you receive may be enough for the professional development or personal enrichment you seek. Second, Niagara partakes in the Community College of the Air Force’s General Education Mobile program. Airmen and women can take their general ed requirements entirely online in four-week chunks. Each class costs less than dinner for two. Last, Niagara is New York’s lone member of the Online Consortium of Independent Colleges & Universities (OCICU). That means students enrolled there have access to online classes from other OCICU schools. Select Niagara as your home institution to search for available courses. SJC Online is the gateway to information about the school’s distance education programs. As long as you’re pursuing a degree (as opposed to a certificate) you can qualify for financial aid to cover your payments. Speaking of money, online students pay a lot less than their on-campus counterparts, at both the undergraduate and graduate level. And active duty military and veterans pay about half of that! Plus, you may be able to apply online work with off-campus studies at five locations conducive to military personnel. Stony Brook is a university center within the SUNY system. It’s got plenty of online programs concentrated in the graduate realms and gets a lot of love for nursing in U.S. News & World Report’s rankings. The university’s online programs are scattered among the various schools and departments that offer them, but you can find them all at one place at the School for Professional Development’s page, SPD Online. Crosscheck this with the Open SUNY listings. The Bursar’s Office explains tuition and fees, which can only be lowered through financial aid and scholarships. The upcoming online courses for the spring and fall semesters reside at the Office of the Registrar, but Stony Brook promotes year-round learning. Its winter session promises three credits in an accelerate three week online course. You can also take summer courses to move up your graduation date. Enter “SPD Online” under the “session” filter. Start with University at Albany’s online learning homepage and go from there to its certificate and degree program listings. Its graduate education programs in particular are top-notch, according to U.S. News & World Report. Learn more about financial aid and costs, which look quite similar to those at other SUNY schools, at the Student Financial Center. If you’re interested in online summer sessions, those are on another page. Catch up or get ahead with a standard 12-week session, accelerated four-week sessions or lightning-fast three-week sessions. University at Albany is a member of the Hudson-Mohawk Association of Colleges and Universities, providing students with a few more options for taking outside coursework in addition to cross-registration opportunities with other SUNY campuses. SUNY Oneonta lists its online programs in unmissable capital letters — ONLINE. But better use Open SUNY to see which individual courses are in distance formats. If you like the looks of this SUNY school, you should learn about the costs and how to cover them. Summer! You could spend it relaxing, or you could study. Before you get bummed, Oneonta runs both long (three-month) and short (three weeks) online summer sessions that are totally flexible. You can find SUNY Oswego’s online programs at the Division of Extended Learning. (Bypass the myOswego password requirements by going straight to its class schedule search and entering an online method of instruction.) If you linger on the extended learning page, you might see a few initiatives of interest. Its adult education programs are custom-built for folks with minimal time and maximum life experience. And you can find a section on awards for nontraditional students in the Scholarship Newspaper. Avoid the snow by signing up for a winter session class in January. Avoid the sun by racking up five courses during a summer session. Keep in mind that both sessions have unique tuition costs. To learn more about tuition and financial aid the rest of the year, leave the extended learning portal. SUNY Plattsburgh runs a small number of online programs and a larger number of online courses. You can see them by scrolling down to “course and program choices” on the distance learning homepage. While you’re there, check out cost information, which is consistent with other SUNY university colleges. Financial aid and scholarship information is elsewhere. In addition to a five-week winter session over the web, the school runs three summer sessions for on-campus and online students — one of them just two weeks long! If you don’t need to earn an online Plattsburgh degree (or even take official Plattsburgh classes), you can sign up for noncredit personal or professional development classes. SUNY Delhi runs a limited number of online degrees extending from the associate to master’s level, with its online bachelor’s programs singled out for praise by U.S. News & World Report. You can navigate from that page to learn about tuition and aid or its accelerated four-week J-Term classes in January, which are exclusively online. If you’re aiming for a graduate-level distance degree or certificate, SUNY Poly offers several (the asterisk indicates online programs). Tuition and fees are all in line with other SUNY institutions. The Financial Aid Office is charged with applying scholarships, grants and loans to your account. Campus-based undergrads and graduates alike have access to online courses during the fall and spring. Need to graduate faster? Register for online courses during SummerIT. SUNY Poly is also a conduit for noncredit online classes if you’re after personal development or professional advancement instead of transferable coursework. This triumvirate of schools files its online programs under Russell Sage Online, and although that particular campus is for female students, no such distinctions are made online. Tuition compares favorably to on-campus programs thanks to the removal of most fees. Of course, the price only goes down as financial aid is applied. University at Buffalo lists its graduate programs and denotes most of those available online. They’re heavily concentrated within its Graduate School of Education, which U.S. News & World Report ranks highly. Since its listings aren’t totally accurate, we recommend crosschecking with what’s on Open SUNY before learning about costs and financial aid. Buffalo may be snowed under in January, but its servers aren’t. Consider taking an accelerated online course through UBThisWinter. Then thaw out with six-, nine-, or ten-week sessions at UBThisSummer. The Middle States Commission on Higher Education (MSCHE) is New York’s regional accreditor. Students at MSCHE-accredited colleges can access financial aid and have a greater range of transfer options than students at nationally accredited institutions. Navigate the Institution Directory to see whether your school holds MSCHE accreditation. You can also search for colleges by adjusting the filters for control (public or private) and degree level. MSCHE maintains a list of schools it has taken negative action against. The three levels are warning, probation and show cause. Each time it acts, MSCHE publishes a Non-Compliance Public Disclosure Statement. Check if your school is named. There are three main reasons why a school wouldn’t be listed in MSCHE’s database: It is unaccredited, it is part of a chain of schools holding regional accreditation elsewhere, or it holds national accreditation. That’s why you should check the Council for Higher Education Accreditation (CHEA) database before jumping to any conclusions. CHEA lists all schools with government-recognized accreditation, whether from a regional or national body. Bramson ORT College is a private college that allows its students to take some distance learning courses. The Department of Education (DoE) placed Bramson on Heightened Cash Monitoring 2 (HCM2) due to recent actions by its accreditor, the New York State Board of Regents, which had placed it on probation in 2013. The school’s HCM2 status means the DoE does not trust it to distribute financial aid using the advance payment method most colleges are allowed to use. Instead, it must pay students and be reimbursed by the DoE, which can cause cash flow problems. Christian Leadership University, a fully online institution, is accredited by Christian Accreditation International. If you’ve never heard of it, that’s because it’s not recognized by the Department of Education as an actual accreditor. Therefore, the school is not in the CHEA database or on College Scorecard. DeVry is a for-profit chain of career colleges with both campus-based and online degrees. Since its main campus is based elsewhere, its regional accreditor is the Higher Learning Commission. In 2016 the Federal Trade Commission sued DeVry, contending that it inflated graduation rates and employment figures. Its accreditor has chosen to wait for more information before taking action. MSCHE accredits Nassau Community College, which offers distance education courses. In 2016 MSCHE placed the college on probation due to concerns about long-term institutional and financial planning, administrative structures, interaction between the school and its students, self-assessment procedures, and student assessment procedures. The college remains accredited while on probation. Read the full public disclosure statement at MSCHE’s website. MSCHE accredits Roberts Wesleyan College, a private school which runs online bachelor’s completion and graduate programs. In 2016 MSCHE placed the college on warning due to concerns about its “institutional effectiveness assessment process” and “assessment of student learning.” The college remains accredited while on warning. Read the full public disclosure statement at MSCHE’s website. MSCHE accredits the United State Merchant Marine Academy, which puts its lone master’s program online. In 2016 MSCHE placed the academy on warning due to concerns about institutional planning, resource allocation, governance structures, administrative systems and student support services. The academy remains accredited while on warning. Read the full public disclosure statement at MSCHE’s website. Middle States Commission on Higher Education (MSCHE): New York’s regional accreditor lists the institutions it accredits and releases public disclosure notices whenever it sanctions one. Western New York Consortium of Higher Education: Though designed more for students wanting to attend on-campus courses at other colleges, this membership organization may allow students at participating schools to register for online courses at other Consortium schools. New York State Education Department: Search by institution or subject for hybrid and online degrees at public and private colleges within the state. New York State Distance Learning Consortium: High schoolers within New York districts that participate in BOCES can search for online classes, including Advanced Placement courses, at this password-protected website. Open SUNY: Find courses and degrees across the 64 state-run colleges and universities on this attractive website. Sign in to bookmark favorites.